WASHINGTON – Sister Lisa Maurer is a Benedictine nun who lives at the St. Scholastica Monastery on the campus of the College of St. Scholastica in Duluth, Minnesota. She works at the Benedictine Health Center next to the monastery, serving senior members of the community. She prays, studies and ministers at local parishes. She also happens to coach a men’s football team. 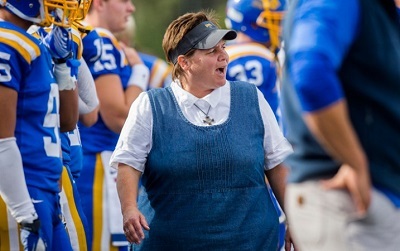 Sister Lisa joined the monastery at St. Scholastica seven years ago, one year before the school established a football program. When the team began practicing in 2008 at a field right behind her residence, she said she would often go outside and watch. The Saints’ head coach, Kurt Ramler, who joined the team in March 2014, approached Sister Lisa and asked her if she would be interested in a coaching position. Though she was hesitant to take on a responsibility that might hinder her vocational duties, Sister Lisa said she felt the commitment would allow her to establish “that special relationship with the student-athletes” that she had experienced in her previous years of coaching girls’ volleyball, basketball, and softball. Now, as the designated coach of the team’s kickers and punters and with a 10-1 record in her pocket, Sister Lisa said she focuses more on just teaching players how to excel on the field. “It’s really about the mission and values of our Benedictine college, what it means to be upstanding young men, to grow into who and how God is calling them to be (and) to recognize that we’ve all been gifted and blessed,” she said. “They have an awesome opportunity to get a great Catholic college education … plus they’re getting to play football, and along with that comes responsibilities of character and being … a good role model,” she said. Above all, Sister Lisa said she hopes the platform she has been given as a woman religious and football coach will focus attention on the presence of God in our everyday lives. “If this gets one young person to think about a religious vocation or service to the church, that would just be outstanding,” she said. “That is very near and dear to my heart because, you know, in our day and age, with all the different voices and all the different influences that young people have, it saddens me to think that the voice of God and the call of God could be getting drowned out.